I really had no idea what to do for an August pie. There’s still lots to be had at the farmers market in August, but not much fruit (that I’ve seen). You can get a butternut squash and I think even early sweet potatoes, but who wants a winter squash pie in August? Then, during a lunch with my friend Abbie and other food-loving friends, one of my very favorite local food bloggers, Elizabeth of Local Savour, recommended prickly pears. And my awesome friend Abbie said that she knew exactly where to find some ripe ones! Henry loves picking tomatoes from the garden, and harvesting anything really, so he was very excited about our prickly pear picking outting. He turned out to really hate it though. And honestly I didn’t love the process either, though maybe it was because Henry whined so much Abbie brought gloves for all of us (I forgot ours), and it seems like you’d be able to just carefully put your fingers around the prickly pear and avoid the glochids (the clusters of spines on the pears) altogether. But we all failed at that- those spines are insidious! We all ended up with fingers full of them and had to use duct tape and tweezers to try to get them out. But hell, we did it! 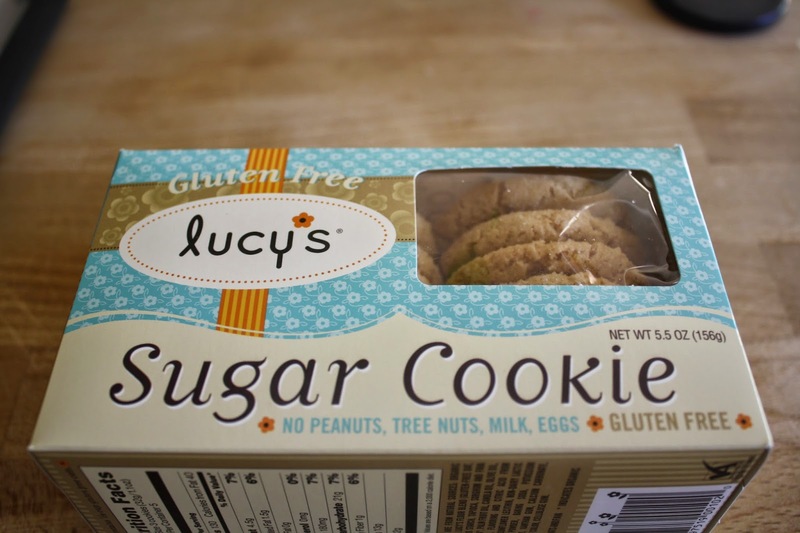 I recommend trying it for yourself with leather gloves and without a toddler in tow. 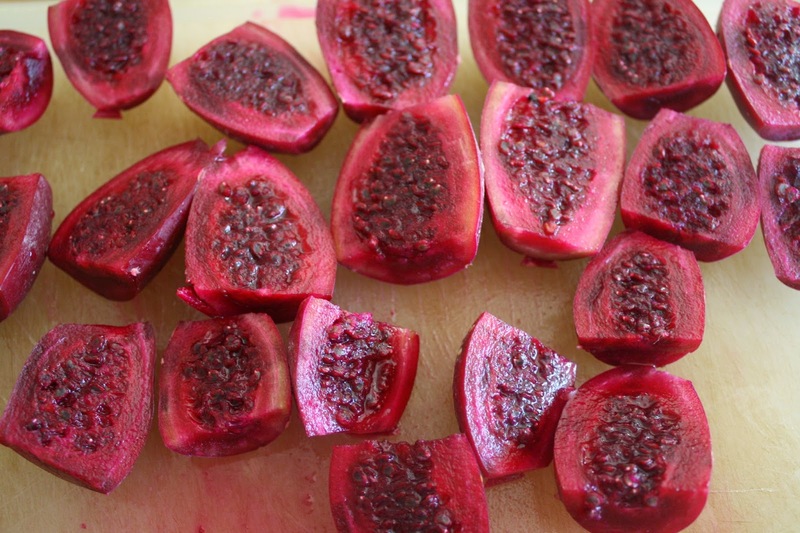 In the past when I’ve used prickly pears (always just one at a time to make Henry’s favorite hot pink lemonade), I’ve either burned the spines off the prickly pears over flames (like from a gas stove or a grill), or just peeled them carefully. This time Abbie taught me an awesome trick where all you have to do is put the pears in a colander and shake them vigorously under running water. It worked beautifully! But I still wanted to be careful about removing the flesh, so I followed a technique from Rick Bayless where you cut of about a 1/2 inch from the top and bottom, cut the rest in half, and scoop out the flesh with a spoon. I ran the flesh through a food mill (it’s super seedy), but you could also just push in through a strainer with a spoon, or mash it up with a potato masher and then strain the juices out. 13 prickly pears gave me almost exactly 1/2 a cup of juice. 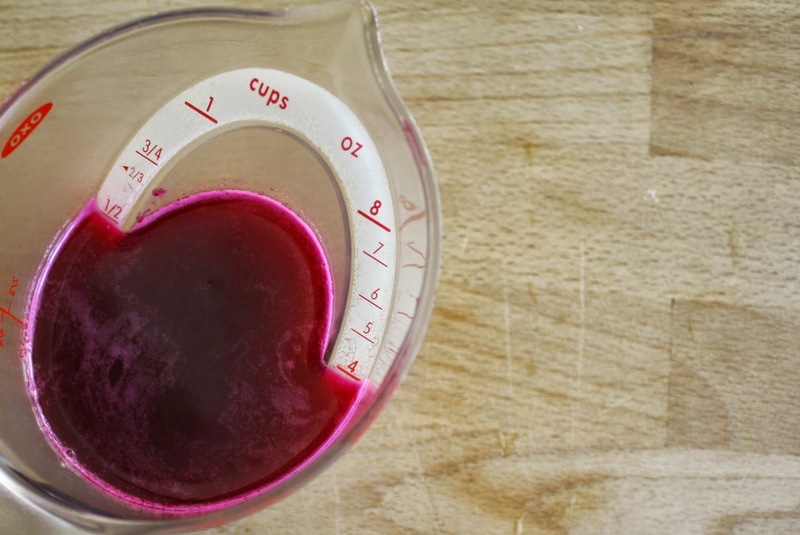 I mixed the cold prickly pear juice with 1/2 a tablespoon of cornstarch and brought it to a boil in a small saucepan, stirring constantly until it thickened up. I didn’t add any sugar because the prickly pears were incredibly sweet. With that done, all I had left to do was make the cookie crust (I used these GF cookies, which I found at Wheatsville- they’re delicious). 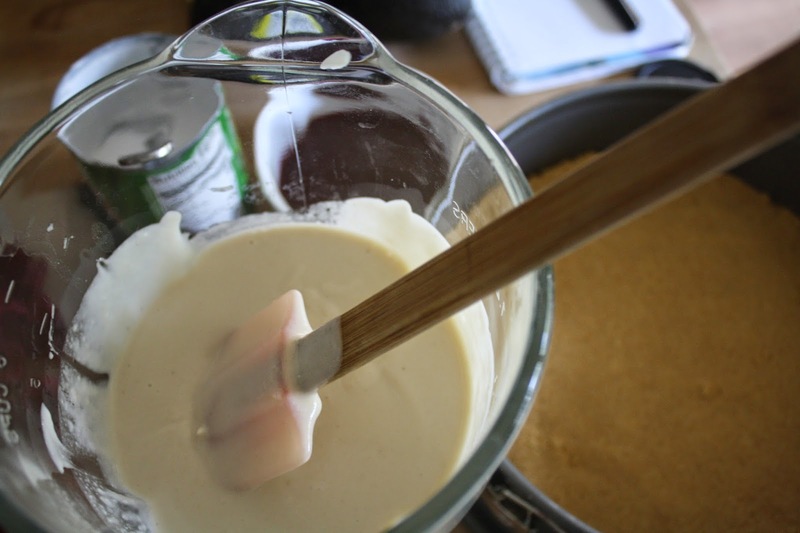 And blend up the super simple cheesecake filling (I had already soaked the cashews for the filling). 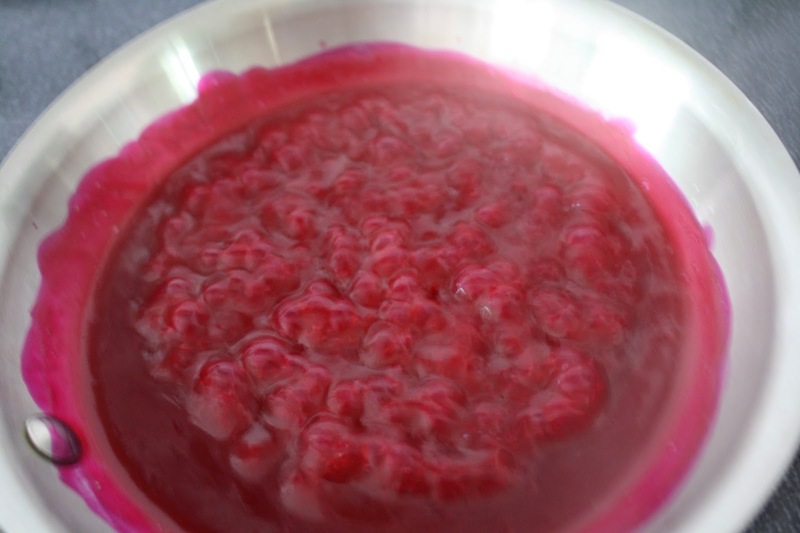 All that remained was swirling my prickly pear puree into the top of the cheesecake and chilling it thoroughly. As it happened, it was in my freezer for 3 weeks before I was able to give it to my sister Joanna, but she said that it was totally delicious, even though she was initially weirded out by the concept of a cheeseless cheesecake. She did note that the original recipe calls for the cheesecake to be served frozen, and that they stored and ate it from the fridge, and that the texture was perfect that way. If you are, for one reason or another, drawn to the idea of a cheeseless cheesecake, give it a spin! Preheat the oven to 350 degrees. Mix the cookie crumbs with coconut oil and press into the bottom of a 9-inch springform pan. Bake for 10 minutes, or until lightly golden brown. Set aside to cool completely. Blend the drained cashews, lemon juice, coconut oil, coconut milk, and honey in a blender. Process until completely smooth, about 3-4 minutes, scraping down the sides as needed and adding a splash of coconut oil or milk if the mixture seems too thick. Put your prickly pears in a colander and, under running water, shake vigorously to knock off the spines and rinse them off the pears. When the pears look smooth, cut a 1/2 inch off the top and bottom, cut in half, and scoop out the flesh. 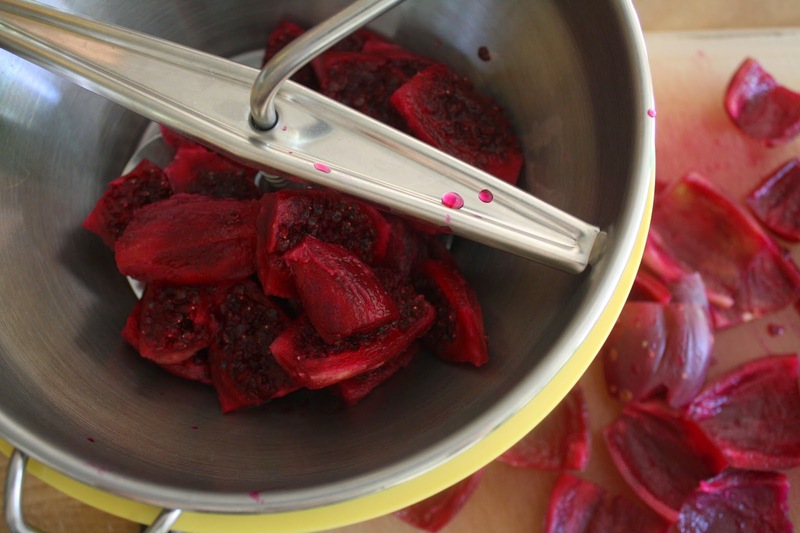 Put the flesh in a food mill and push through to separate the juice and pulp from the seeds. Combine 1/2 cup of juice with 1/2 tablespoon cornstarch, transfer to a small pan, and bring to a boil over medium heat, stirring constantly, until thickened. Pour the filling into cooled cookie crust. 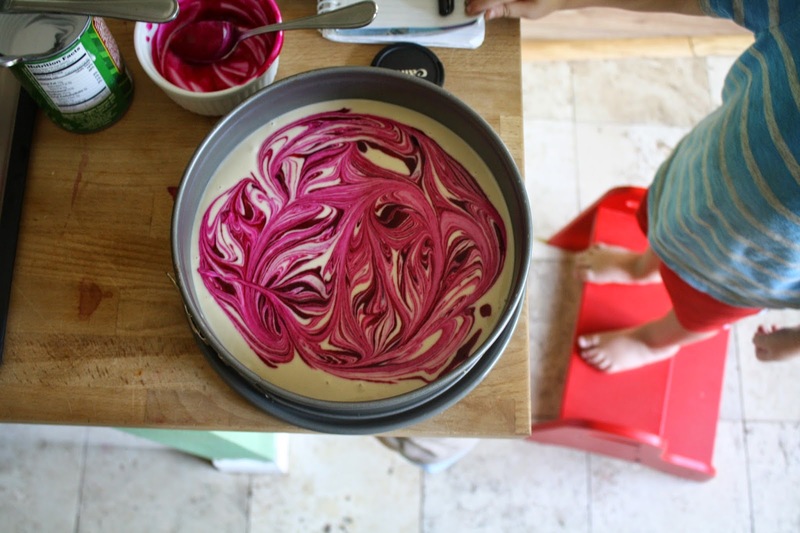 Drop spoonfuls of the thickened prickly pear puree onto the top of the cheesecake and swirl into the filling with a butter knife. 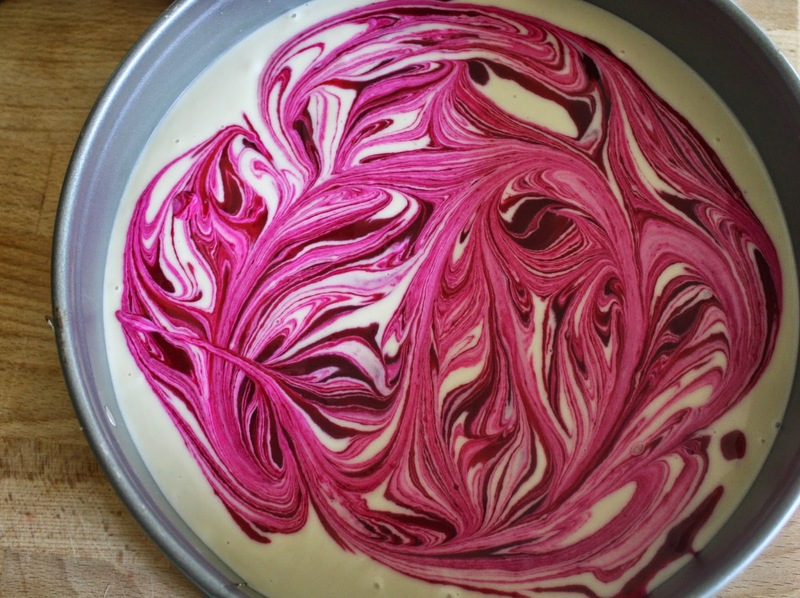 Transfer the finished cheesecake to the freezer and freeze until firm- at least three hours. At this point you can leave it in the freezer, covered, until you’re ready to eat it, but I would move it to the refrigerator and let it thaw out for a few hours (or more) before you dig in.